I have to admit, I’ve never had an authentic cheesesteak before. I’ve never been to Philadelphia. I’ve never been to New Jersey. Like my coveted Italian beef, I know there are going to be restaurants outside of those areas that claim to be “authentic” but don’t even come close. 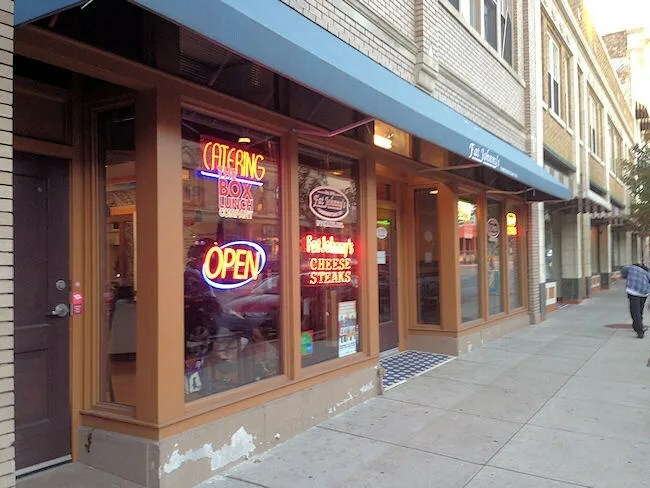 Fat Johnny’s Cheesesteak Company in downtown Grand Rapids is one of those places. The simple restaurant on Division Avenue serves only three sandwiches. They have the Original Cheesesteak, a Chicken Cheesesteak and Roast Pork With Broccoli Rabe. That’s it. I walked in just before closing time on a Friday night. There were a couple other groups of people in the smaller part of the restaurant, but there’s another huge dining room sort of in the back of the restaurant. Up front, there are a handful of pub tables and a counter overlooking the street. I ordered The Original Fat Johnny’s Cheesesteak Jersey Style. I sort of screwed up because I actually wanted Philly style, but I got the two confused. The difference is Philly Style is made with Cheez Whiz while Jersey is White American cheese. I opted for the whole sandwich and added on an order of Roast Garlic Fries which brought the total bill to just a hair under $13. It took ten minutes or so for the fries and sandwich to be wrapped in foil and handed to me. Just by looking at the packaging, I realized I probably didn’t need the “whole” sandwich. When I got back to work, I started with the fries. 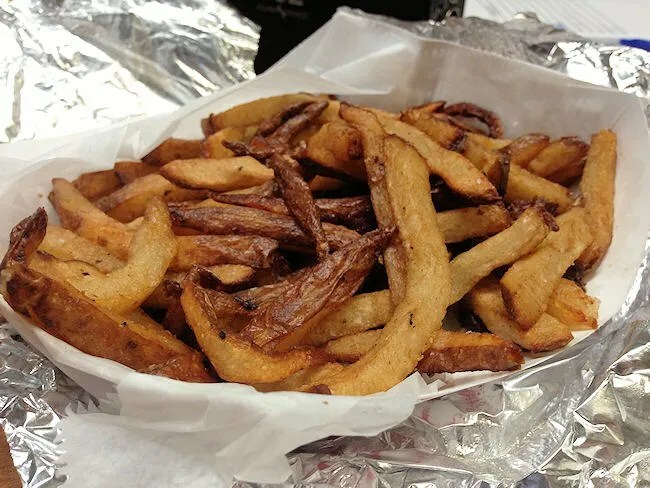 The delicious fresh cut, skin on potato sticks are covered with a roasted garlic flavoring. It’s one of those tastes that is really good at first, but the size of the order is pretty large. After a while, it got to be a little too much garlic. Next time, I would probably just order the regular fries. They were really delicious…it’s just one of those too much of a good thing type of deals which is really kind of stupid to complain about when you think about it. The large sandwich was pretty intimidating when I unwrapped. I stuck to a simple sandwich of sliced rib eye and white American cheese. They have a whole list of add-ons, but for my first trip, I really wanted to just stick to a simple meal that would let me enjoy the deliciousness of the main ingredients of the sandwich. The bread was a huge highlight of the sandwich. Fat Johnny’s claims on their Facebook page to fly the bread in from Philadelphia. The hoagie type roll was perfect for the juicy meat on melty cheese. As I mentioned earlier, the whole sandwich was huge. I easily could have just stuck to the half sandwich and I should have because I have control issues…if there’s food in front of me, I’m going to eat whether I’m hungry or not…and I did. 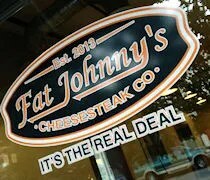 Fat Johnny’s Cheesesteak Company is a simple place that focuses on one product with the intent of perfecting it. 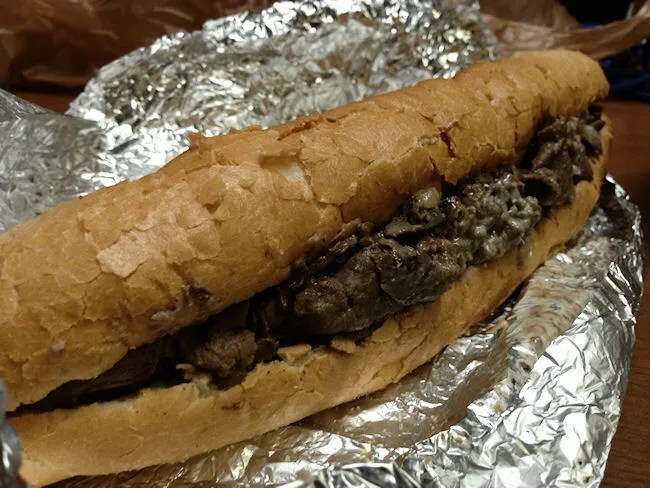 It’s hard for me to judge whether or not this is an “Authentic” cheesesteak because I’ve never actually had an authentic one. I liked the sandwich I had though and would definitely go back again. OMG!!! Both the Sandwich and the Fries look “AWESOME”!!!!!! !